Maybe it is the satisfying crunch of the crust followed by a greeting of delicious fillings, or perhaps it is the effortless preparation and fresh ingredients that makes our Plaited Pizza Loaf recipe a must-try. Enjoy a perfect slice every time and fall in love with an intricately balanced centre of fresh herbs, thinly sliced beetroot, toasted pine nuts and a rich serving of creamy blue cheese. Resembling a golden-hued baguette with a savoury inside, our Plaited Pizza Loaf is a great way of keeping things fresh come dinner-time. By itself, it stands as a decadent entrée or an exciting main course. Sporting a woven crust, it styles dinner tables with grace, only matched by its equally enticing flavour. 1. Combine the beetroot with the olive oil and balsamic vinegar and bake at 200°C for approx. 35 min. or until tender. 2. On a floured surface, roll out the dough into an elongated oval shape. Carefully move the dough over to a piece of baking parchment, then cut the dough along the edge on both sides moving towards the middle. 3. 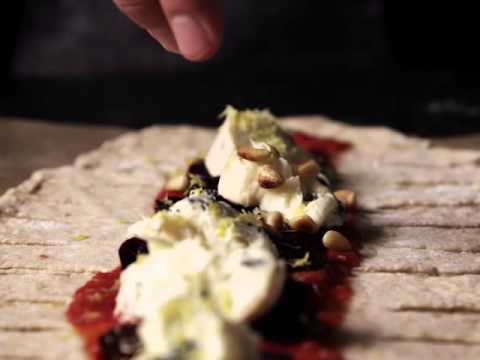 Spread tomato sauce, baked beetroot, Creamy Blue cheese, pine nuts, lemon zest and thyme on the middle 1/3 of the pizza dough. 4. Plait the pizza so the narrow bands of dough on each side cross each other. 5. Beat the egg yolk with the water and brush the pizza dough with the mixture. 6. Carefully move the pizza on the baking parchment over to the hot baking sheet and bake on the bottom rack at 250°C for approx. 15 min. or until crispy and golden. Enjoying intricate flavours and an all-encompassing crust, our Plaited Pizza Loaf recipe offers a unique angle on festive dining with classic pizza flavour and a blue cheese twist. Having been added fresh thyme and lemon zest, aromas are bright, running in unison with a dash of sweet tomato sauce. A light drizzle of balsamic vinegar and thinly sliced beetroot ensures that flavours retain their intensity when baked, resulting in golden treats perfect for sharing!